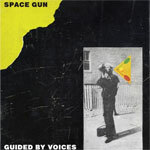 Original release notes: Title track from GBV's masterful 2018 opus Space Gun. The new GBV line-up (Pollard / Gillard / March / Bare Jr. / Shue) is blazing hot, and recently wowed audiences at Growlers Fest and Coachella. The band boasts that the album is so good, they are putting out just one new album in 2018! B-side "Kingdom of Cars", not available elsewhere, is a rare bird - a Pollard composition, sung by guitarist Doug Gillard.